BEIJING - Soccer player Gao Leilei said he has nothing more to ask for in life. He cannot say the same for today's aspiring teenagers following his footsteps. After eight years in China's top First Division A league and four years abroad, Gao, 30, has earned himself a comfortable life that most Chinese white-collar employees could barely afford. He lives in an exclusive residential community in Beijing, drives a limousine and is dating an up-and-coming actress. "At least I can feed myself," the veteran player told China Daily on a soccer field in Beijing, watching a group of teenage players training nearby. "But for them, despite their passion and talent, their futures may be hopeless unless there's some radical change in the current regime of the soccer industry," Gao continued. "In China, it takes more than talent and hard training for one to play professional. A family that is rich enough not only to afford his training but also to buy him some recommendations from an influential coach is also necessary." Gao said this has been a "well-known, unwritten practice" on the field, which he personally knows well. Gao began his professional career in Wuhan, capital of Hubei province, in 1998 thanks to a recommendation from close family friend Gong Jianping, a referee in the First Division A league, now known as the Super League. "Without him, I wouldn't have had the chance to play professional," Gao said. "My parents are well-off but not rich." Thanks to his outstanding performance, Gao moved back to Beijing and played for the city's Guo'an team one year later. 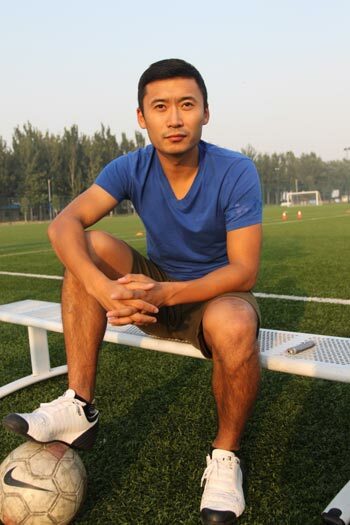 Yet despite a booming career in 2000, one event dampened his enthusiasm toward soccer in China. After a call to clean up the league from the China Football Association (CFA), China's soccer industry watchdog, Gong, Gao's mentor, became the only one who came forward to confess. Gong was sentenced to 10 years in jail for receiving 370,000 yuan ($55,000) in bribes during his decades-long career. Four years later, the referee died in jail of leukemia. "I had known Gong since I was a child. He was a good man and a good tutor," Gao said. "Few in the industry dare to claim they have kept their hands clean." Gao was proven right when other big-name referees including Lu Jun and Huang Junjie were found guilty during a recent campaign against corruption by the CFA. "At least Gong was honest to himself. But thanks to his honesty, he became the scapegoat of the anti-corruption campaign in 2000," Gao recalled. That was part of the reason he decided to go overseas in 2006. Gao played in Australia, Finland and the United States where soccer is far from being the most popular sport. "I could have earned much more if I stayed in China. But I couldn't take it any more," Gao said. "As long as I realized players in this league were manipulating and fixing matches, I knew I had to move." Four years after Gao began his overseas adventure, China launched its anti-corruption sweep on soccer. The police arrested a number of Chinese soccer officials including former CFA vice-president Xie Yalong and his successor Nan Yong for bribery and match fixing and detained a number of suspected referees and players. "It cheered the fans' hearts greatly and the criminals deserve it," said Gao, who returned home in 2010 and is now playing in a secondary league while fighting a lingering knee injury. "They've ruined Chinese soccer and players' lives." Gao said he hopes the situation will change some day. "We have to come up with a new regime to ensure those really talented ones have the chance to stand out and compete as professionals," Gao said. Gesturing toward the teenage players training nearby, he added, "only that way will they have a future."